Douglas Lwanga (right) shares a light moment with musician Sheebah Kalungi recently. File photo. 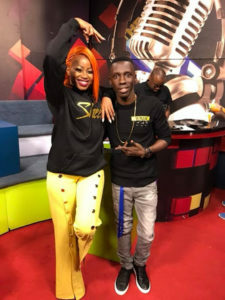 After weeks of constant stories surrounding the sudden disappearance of Douglas Lwanga from NTV and its daily programme known as “NTV The Beat,” the former host of the show has come out and clarified several issues to his fans. Douglas who previously worked for Record TV through his Facebook and Twitter handle expressed shock about the rumours going around. “I have been watching,hearing and seeing stories about me. I am shocked myself as much as you have. Please allow me make some things clear,” Douglas said. “My journey didn’t start five years ago. Some of you know my story, how i came on screen, how i have grown to how the Purple Party started and so much more,” he added. Douglas who has spent five years on NTV after moving from Record TV in 2013 also expressed his delight to have been on the “NTV The Beat” programme for such a long period of time. “The 5years i have been on NTV have been awesome just like the years i spent doing KATOGO on RecordTV. We have done so much together, won so many Awards, grown a huge fan base but most importantly i have been able to witness the continued growth of Ugandan Music and talent, something i love to do with passion,” he said.. Responding to the rumours that he was fired, Douglas had this to say. “Never in my life have i ever been fired from a job as some people are reporting. In all places I have worked for, I actually put in 200% in what i do,” he said. “Passion drives me the most if you can ask those close to me because they know well. But sometimes life has to move on especially if better opportunities surface. It is not a bad thing, we are humans and always pursue better and more,” Douglas said. Douglas also took time to thank NTV who opened the door for him and helped him along the journey as he gained valuable experience. “Thank you NTV for opening doors for me, It was a wonderful journey and experience. Going forward i will not be hosting the BEAT,” he said. “Wow the journey was amazing i don’t regret, I also salute the entire team as your support contributed a lot to the success of the show,” he added. Douglas went a head and promised his fans that something new is on its way and they should not worry. “Its kitchen time cooking something bigger and better just be patient and trust me when the time is right i will let you know my next step. I promise you upgraded Entertainment,” he said. On the purple party and if it will still run annually, Douglas had this to say. “The Purple Party is an independent Event registered and run by Brand Purple (U) Ltd. This means our plans still stay and this years Event calendar will be announced soon,’ he said. “The Purple Party Tours resume in April and I will let you know where we shall be. As always hosted by me, so we are on 100%,” he added. Douglas is believed to be in his way to NBS but we will have to wait and see if the deal materializes.